Vertigo is a sense of spinning dizziness. The reasons for vertigo can be many. It can happen if there is a problem with the inner ear, brain, or a sensory nerve pathway. The causes could be Central or Peripheral. The central causes of vertigo arise in the brain or spinal cord, while peripheral vertigo happens due to a problem within the inner ear. Vertigo is distinct from lightheadedness, dizziness and unsteadiness. Though it can happen at any age, it's most common for those over 65 years of age. Vertigo is a symptom, rather than a condition itself. Vertigo can be temporary or long-term. The attacks of vertigo can be sudden and last for a few seconds, or much longer. If you have these attacks coming back frequently for several days, and interfering with your normal life, it is time you consult a general physician. 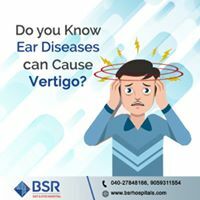 You may also experience additional symptoms depending on the cause of vertigo, such as a high temperature, hearing loss and ringing in your ears (tinnitus). Videonystagmography (VNG) is sometimes used to check for signs of nystagmus in more detail. Nystagmus can indicate if the organs that help you to balance have a problem. Caloric testing A caloric test involves running warm or cool water or air into your ear for about 30 seconds to see if the balance organ in the ear is affected. Scans Your doctor may advice a scan of your head to look for the cause of your vertigo, like a non-cancerous brain tumour. Usually, either a magnetic resonance imaging (MRI) scan or a computerised tomography (CT) scan is used for diagnosis. Some cases of vertigo improve with time, without any treatment. However, some people have repeated episodes for many months, or even years, such as those with Meniere's disease. Your ENT specialist will be the best person to guide you on the treatment depending on the individual case. The treatment for Vertigo depends on the cause or the condition responsible for vertigo. If vertigo is caused by Labrynthitis (inner ear infection) it is normally caused by a viral or bacterial infection antibiotics may be prescribed. Why prefer BSR ENT Hospital for your treatment? BSR is equipped with latest Technologies and Equipment and has its own Otoneuro Clinic for ear disorders. It uses Middle Ear Transducers (MET), Zeiss Microscope, Lasers, Clinical and Biochemical Laboratory / Radiology for diagnosis and effective treatment. The vast experience and expertise of doctors are a value add which ensure safe and successful treatment outcomes. The patient-centric approach is very much valued by their patients. The doctors and the nursing staff are patient-friendly and compassionate to address any kind of discomfort or pain of the patient.